Disclaimer: It was too late to realize that Monitor miniature I lend to some fellow during the last tournament. I'm sure it's somewhere in the club, but Cipher had to step in for this battle. 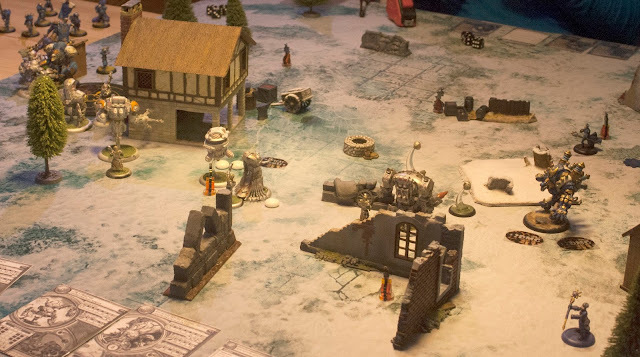 At the start of each player’s Maintenance Phase, the active player rolls 3d6. All models have their LOS reduced to a number of inches equal to the result of this roll for one turn. While within 4˝ of a Flare marker, models lose and cannot gain concealment, cover, or Stealth . Models ignore LOS when declaring charges or attacks against a model within 4˝ of a Flare marker. Phase he must roll to determine if a crate explodes due to the battle raging nearby. The active player rolls a d6 for each crate on the table. On a roll of 1, the crate explodes and the active player places a 5˝ AOE in play with its center point touching any part of the crate. Remove the crate from the table. Models in the AOE are hit and suffer a POW 14 fire damage roll . 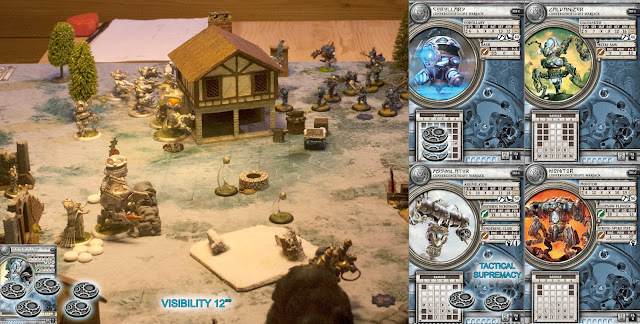 Snowdrift terrain feature is represented by a 4˝ AOE template. Models completely within a Snowdrift gain concealment, and models without Immunity: Cold treat it as rough terrain. CoC first turn past in sprinting forward and repositioning the right wing to the middle. 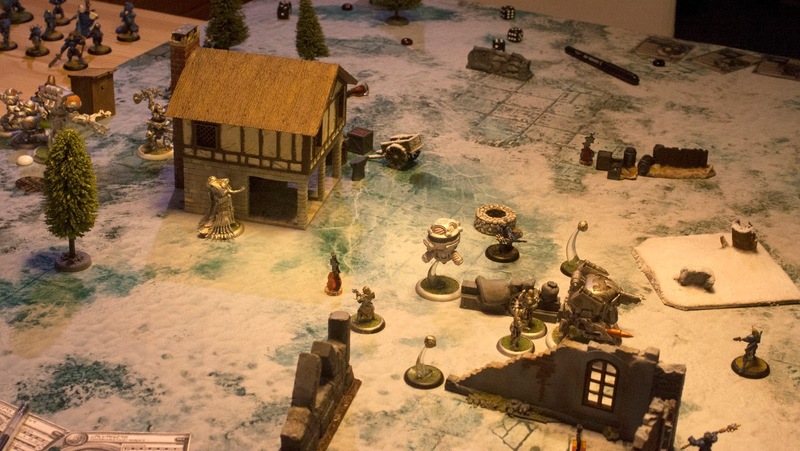 Assimilator used his "tactical supremacy" to move further and advance towards the Cygnar right wing. Commander Sturgis was fully aware that on his road to warmth next to the fire there will be a wall of steel construct warriors. If he would like to have any chance in taking that wall down, he has to get rid of Enigma Foundry that he can barely see behind that wall. So he immediately dispatched his Hunter, enhancing his range with snipe magic. Shot from the hunter connected with steel abomination, making severe damage, but it was still standing fully functional. At the begging of CoC second turn, crate of dynamite on their right flank exploded. Luckily there were nobody in vicinity to get hurt. Because of the poor visibility, Coc force continued to advance, with obstructors in shield wall, and jacks closing on Cygnar right flank. Only Monitor slowed his advance to protect right flank of his army. Galvaniser returned few hitpoints to Enigma foundary. Lieutenant Jakes heard distant sound of fight carried by the wind but muffled by the snow. Scared that she will be latte for the party she cast Energizer and commanded her Tunderhead to run. On other flank Sturgis dispersed his infantry which front ranks took a few shots on obstructors and he sent Stormclad straight in to the steel wall, and few constructs fell to his mighty sword. Through that commotion hunter tried to put a killshot in to the enigma foundry, but missed. 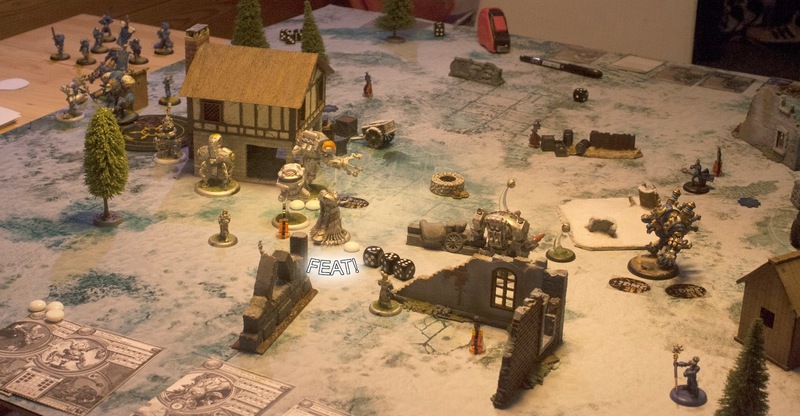 On the far left eredicators run to tie the hunter in meele and save enigma foundry from more pain. Assimilator, moving by the side of forge, made his ground pounder attack, killing 3 stormblades and their officer. Mother used him as arc node to put backlash on Stormclad. Killed obstructors were reconstructed by enigma foundry and charged stormclad dealing little damadge to him, but dealing 2 damage to Sturges. Monitor shot tunderhead for minor 3 damage. Sturgis had the steel wall right where he wanted them. He run strait in to them, swirling his blades, and with his great arcane might pulling enemies close to him, killing them row by row. Few obstructors that survived onslaught was killed by stormblades. From two CoC infantry units, only one eredicator was still standing. 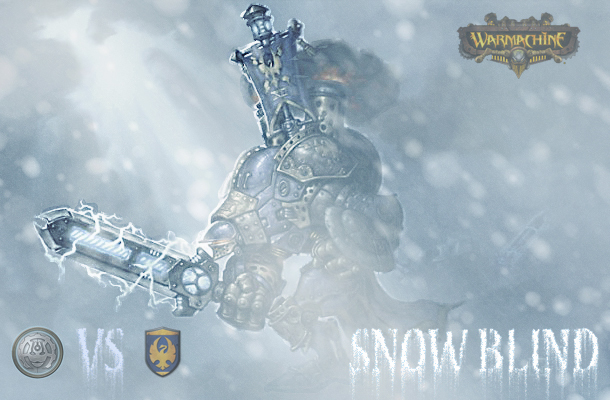 Thunderhead was eager to make in to melee with Monitor, but snowdrift stood in his way. Lieutenant Jakes commanded him to go around the deep snow and to take a shot on enemy jack instead, making some damage. With left wing almost colapsed, it was time for Mother to return the blow. Galvanizer run in front of enemy force. Then Mother poped her feat and channeled through Galvanizer a shrapnel storm spell on one of stormblades. This killed all but sergent, and made 2 more damage to Sturgies. 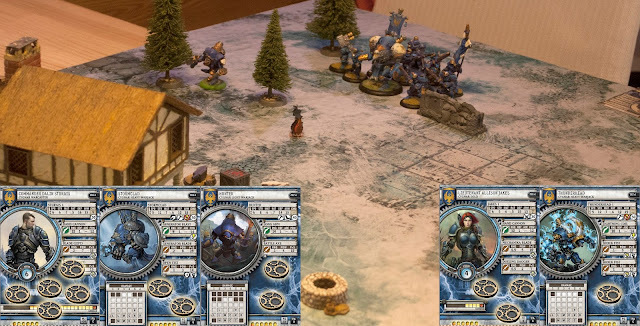 Assimilator turned around the house and clipped Sturgis and stormclad with his groundpounder attack, dealing hefty damage to Sturgis leaving him with just 5 point left. With assistance of Mothers servitors, Monitor stood his ground and shot at tunderhead taking his left arm off. One of eredicators returned to his unit by enigma foundery. Knowing little about drama unfolding on right wing, Lieutenant Jakes threw her damaged tundehead on monitor and huge jeack almost leveled monitor to the ground, leaving him barely functional. Sturgis backed off to take care for his wounds, while his badly damged stormclad, hunter and one stormcaller covered his retreat. For Mother this was time for coupe de gras. She sent Assimilator strait in to the stormhead which made quick work of it, and left Sturgis with just 4 wounds. On the right flank optifix directive quicly patch up the Monitor and made him fully functional. Heavy jack kept biting tunderhead until he could not take it anymore. At this moment both commanders realized that at this time there is enough place in front of forge fireplace, so remaining warriors rushed in to the building to worm their bones/liquify their oil. For last two years, or better to say, since when MK3 arrived, I played Warmachine just in turnaments, 3-4 times a year. With all "living" rules and cards, I slightly lost interest in game. 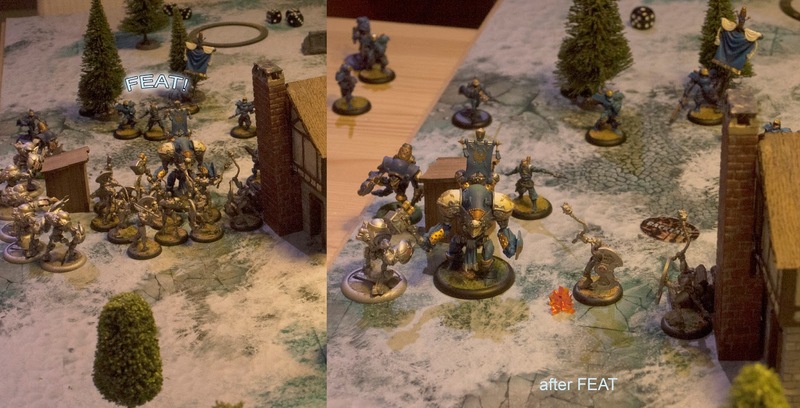 When my son showed interest in game (we played two times couple years ago, but then switched to another games) I tried to find new way to play then just steamroller. Scenarios from Escalation are still vivid in my memories. Quick search on internet lead me to Crossroads of courage league. 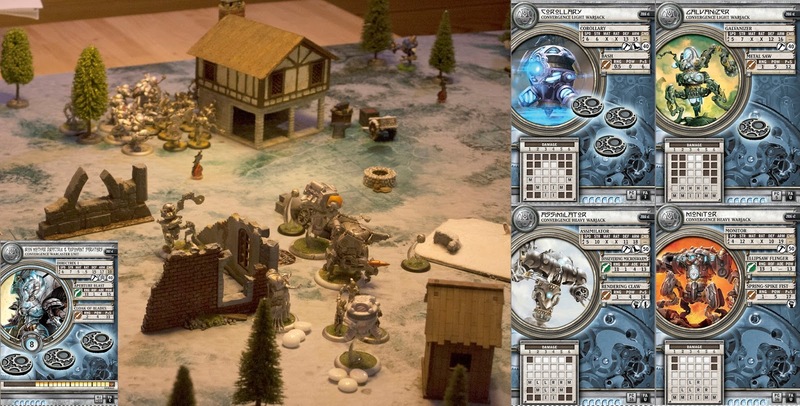 With few scenarios and new terrain rules, I found what I was looking for. I put my 3D printer in work, and two days latter we were ready to battle accross Upper Wyrmwall Mountains. 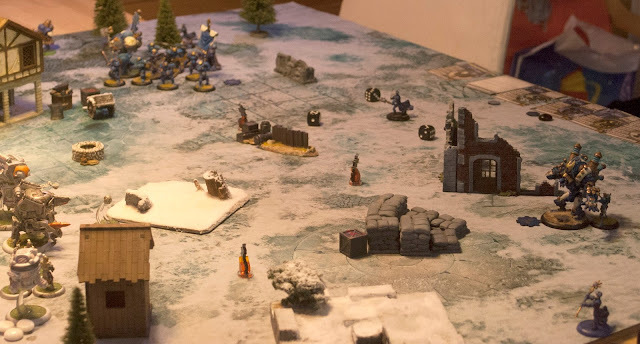 Game played in this way, brings found memories of first edition to me, and how I loved to play this game. For some time ahead scenarios and Company of iron will be the only ways I play this game.